Rat Enthusiast: "I Can See God In Their Eyes." Filed to: rats!Filed to: rats! 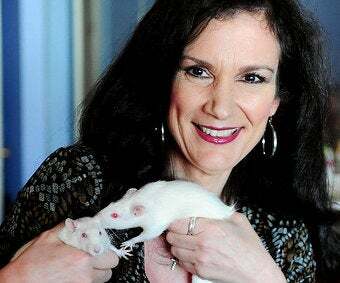 Here's a woman who's invested in rehabilitating the image of her beloved rats. All of whom appear to be practicing Catholics. And vegetarians. In Dianne Rochenski's words, "It's exterminators that give them a bad name...it's blood money." No word on what her daughter thinks about the domestic rodent infestation (which is far more palatable than, say, just letting rats breed in your house like this), but any potential romance will have to abide by the "love me, love my rats" policy. "People joke with me. They say, 'What if you meet someone?' Well, they're going to have to accept this...Except I'd get a bigger bed."